There are many who approach MS Windows networking with incredible misconceptions. That's okay, because it gives the rest of us plenty of opportunity to be of assistance. Those who really want help are well advised to become familiar with information that is already available. You are advised not to tackle this section without having first understood and mastered some basics. MS Windows networking is not particularly forgiving of misconfiguration. Users of MS Windows networking are likely to complain of persistent niggles that may be caused by a broken network configuration. To a great many people, however, MS Windows networking starts with a domain controller that in some magical way is expected to solve all network operational ills. The Example Domain Illustration shows a typical MS Windows domain security network environment. Workstations A, B, and C are representative of many physical MS Windows network clients. Basic file and directory permission control in UNIX/Linux. Understanding how MS Windows clients interoperate in a network environment. Do not be put off; on the surface of it MS Windows networking seems so simple that anyone can do it. In fact, it is not a good idea to set up an MS Windows network with inadequate training and preparation. But let's get our first indelible principle out of the way: It is perfectly okay to make mistakes! In the right place and at the right time, mistakes are the essence of learning. It is very much not okay to make mistakes that cause loss of productivity and impose an avoidable financial burden on an organization. Where is the right place to make mistakes? Only out of harms way. If you are going to make mistakes, then please do it on a test network, away from users, and in such a way as to not inflict pain on others. Do your learning on a test network. What is the key benefit of Microsoft Domain Security? In a word, single sign-on, or SSO for short. To many, this is the Holy Grail of MS Windows NT and beyond networking. SSO allows users in a well-designed network to log onto any workstation that is a member of the domain that contains their user account (or in a domain that has an appropriate trust relationship with the domain they are visiting) and they will be able to log onto the network and access resources (shares, files, and printers) as if they are sitting at their home (personal) workstation. This is a feature of the domain security protocols. The benefits of domain security are available to those sites that deploy a Samba PDC. A domain provides a unique network security identifier (SID). Domain user and group security identifiers are comprised of the network SID plus a relative identifier (RID) that is unique to the account. User and group SIDs (the network SID plus the RID) can be used to create access control lists (ACLs) attached to network resources to provide organizational access control. UNIX systems recognize only local security identifiers. A SID represents a security context. For example, every Windows machine has local accounts within the security context of the local machine which has a unique SID. Every domain (NT4, ADS, Samba) contains accounts that exist within the domain security context which is defined by the domain SID. The result is that every account in the Windows networking world has a globally unique security identifier. Network clients of an MS Windows domain security environment must be domain members to be able to gain access to the advanced features provided. Domain membership involves more than just setting the workgroup name to the domain name. It requires the creation of a domain trust account for the workstation (called a machine account). Refer to Domain Membership for more information. Samba-3 supports the use of a choice of backends that may be used in which user, group and machine accounts may be stored. Multiple passwd backends can be used in combination, either as additive backend data sets, or as fail-over data sets. An LDAP passdb backend confers the benefit that the account backend can be distributed and replicated, which is of great value because it confers scalability and provides a high degree of reliability. Windows NT4 domain trusts. Samba-3 supports workstation and server (machine) trust accounts. It also supports Windows NT4 style interdomain trust accounts, which further assists in network scalability and interoperability. Operation without NetBIOS over TCP/IP, rather using the raw SMB over TCP/IP. Note, this is feasible only when operating as a Microsoft active directory domain member server. When acting as a Samba domain controller the use of NetBIOS is necessary to provide network browsing support. Samba-3 provides NetBIOS name services (WINS), NetBIOS over TCP/IP (TCP port 139) session services, SMB over TCP/IP (TCP port 445) session services, and Microsoft compatible ONC DCE RPC services (TCP port 135) services. Management of users and groups via the User Manager for Domains. This can be done on any MS Windows client using the Nexus.exe toolkit for Windows 9x/Me, or using the SRVTOOLS.EXE package for MS Windows NT4/200x/XP platforms. These packages are available from Microsoft's Web site. Implements full Unicode support. This simplifies cross-locale internationalization support. It also opens up the use of protocols that Samba-2.2.x had but could not use due to the need to fully support Unicode. SAM replication with Windows NT4 domain controllers (i.e., a Samba PDC and a Windows NT BDC, or vice versa). This means Samba cannot operate as a BDC when the PDC is Microsoft-based Windows NT PDC. Samba-3 can not participate in replication of account data to Windows PDCs and BDCs. Acting as a Windows 2000 active directory domain controller (i.e., Kerberos and Active Directory). In point of fact, Samba-3 does have some Active Directory domain control ability that is at this time purely experimental. Active directory domain control is one of the features that is being developed in Samba-4, the next generation Samba release. At this time there are no plans to enable active directory domain control support during the Samba-3 series life-cycle. The Windows 200x/XP Microsoft Management Console (MMC) cannot be used to manage a Samba-3 server. For this you can use only the MS Windows NT4 Domain Server Manager and the MS Windows NT4 Domain User Manager. Both are part of the SVRTOOLS.EXE package mentioned later. Windows 9x/Me/XP Home clients are not true members of a domain for reasons outlined in this chapter. The protocol for support of Windows 9x/Me-style network (domain) logons is completely different from NT4/Windows 200x-type domain logons and has been officially supported for some time. These clients use the old LanMan network logon facilities that are supported in Samba since approximately the Samba-1.9.15 series. 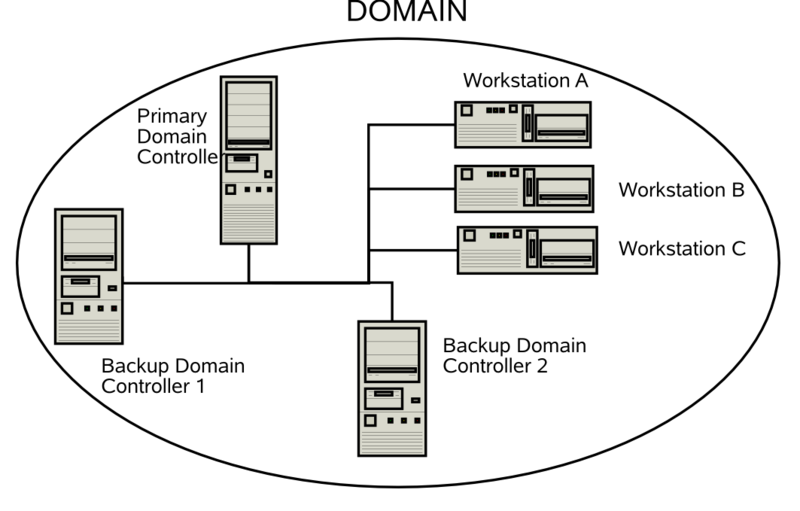 Samba-3 implements group mapping between Windows NT groups and UNIX groups (this is really quite complicated to explain in a short space). This is discussed more fully in Group Mapping: MS Windows and UNIX. Samba-3, like an MS Windows NT4 PDC or a Windows 200x Active Directory, needs to store user and Machine Trust Account information in a suitable backend data-store. Refer to MS Windows Workstation/Server Machine Trust Accounts. With Samba-3 there can be multiple backends for this. A complete discussion of account database backends can be found in Account Information Databases. When network administrators are asked to describe the benefits of Windows NT4 and active directory networking the most often mentioned feature is that of single sign-on (SSO). Many companies have implemented SSO solutions. The mode of implementation of a single sign-on solution is an important factor in the practice of networking in general, and is critical in respect of Windows networking. A company may have a wide variety of information systems, each of which requires a form of user authentication and validation, thus it is not uncommon that users may need to remember more than ten login IDs and passwords. This problem is compounded when the password for each system must be changed at regular intervals, and particularly so where password uniqueness and history limits are applied. There is a broadly held perception that SSO is the answer to the problem of users having to deal with too many information system access credentials (username/password pairs). Many elaborate schemes have been devised to make it possible to deliver a user-friendly SSO solution. The trouble is that if this implementation is not done correctly, the site may end up paying dearly by way of complexity and management overheads. Simply put, many SSO solutions are an administrative nightmare. SSO implementations utilize centralization of all user account information. Depending on environmental complexity and the age of the systems over which a SSO solution is implemented, it may not be possible to change the solution architecture so as to accomodate a new identity management and user authentication system. Many SSO solutions involving legacy systems consist of a new super-structure that handles authentication on behalf of the user. The software that gets layered over the old system may simply implement a proxy authentication system. This means that the addition of SSO increases over-all information systems complexity. Ideally, the implementation of SSO should reduce complexity and reduce administative overheads. The initial goal of many network administrators is often to create and use a centralized identity management system. It is often assumed that such a centralized system will use a single authentication infrastructure that can be used by all information systems. The Microsoft Windows NT4 security domain architecture and the Micrsoft active directory service are often put forward as the ideal foundation for such a system. It is conceptually simple to install an external authentication agent on each of the disparate infromation systems that can then use the Microsoft (NT4 domain or ads service) for user authentication and access control. The wonderful dream of a single centralized authentication service is commonly broken when realities are realized. The problem with legacy systems is often the inability to externalize the authentication and access control system it uses because its implementation will be excessively invasive from a re-engineering perspective, or because application software has built-in dependencies on particular elements of the way user authentication and access control were designed and built. Over the past decade an industry has been developed around the various methods that have been built to get around the key limitations of legacy information technology systems. One approach that is often used involves the use of a meta-directory. The meta-directory stores user credentials for all disparate information systems in the format that is particular to each system. An elaborate set of management procedures is coupled with a rigidly enforced work-flow protocol for managing user rights and privileges within the maze of systems that are provisioned by the new infrastructure makes possible user access to all systems using a single set of user credentials. The Organization for the Advancement of Structured Information Standards (OASIS) has developed the Security Assertion Markup Language (SAML), a structured method for communication of authentication information. The over-all umbrella name for the technologies and methods that deploy SAML is called Federated Identity Management (FIM). FIM depends on each system in the complex maze of disparate information systems to authenticate their respective users and vouch for secure access to the services each provides. SAML documents can be wrapped in a Simple Object Access Protocol (SOAP) message for the computer-to-computer communications needed for Web services. Or they may be passed between Web servers of federated organizations that share live services. The Liberty Alliance, an industry group formed to promote federated-identity standards, has adopted SAML 1.1 as part of its application framework. Microsoft and IBM have proposed an alternative specification called WS-Security. Some believe that the competing technologies and methods may converge when the SAML 2.0 standard is introduced. A few Web access-management products support SAML today, but implemention of the technology mostly requires customization to integrate applications and develop user interfaces. In a nust-shell, that is why FIM is a big and growing industry. Ignoring the bigger picture, which is beyond the scope of this book, the migration of all user and group management to a centralized system is a step in the right direction. It is essential for interoperability reasons to locate the identity management system data in a directory such as Microsoft Active Directory Service (ADS), or any proprietary or open source system that provides a standard protocol for information access (such as LDAP) and that can be coupled with a flexible array of authentication mechanisms (such as kerberos) that use the protocols that are defined by the various general security service application programming interface (GSSAPI) services. A growing number of companies provide authentication agents for disparate legacy platforms to permit the use of LDAP systems. Thus the use of OpenLDAP, the dominant open source software implementation of the light weight directory access protocol standard. This fact, means that by providing support in Samba for the use of LDAP and Microsoft ADS make Samba a highly scalable and forward reaching organizational networking technology. Microsoft ADS provides purely proprietary services that, with limitation, can be extended to provide a centralized authentication infrastructure. Samba plus LDAP provides a similar opportunity for extension of a centralized authentication architecture, but it is the fact that the Samba Team are pro-active in introducing the extension of authentication services, using LDAP or otherwise, to applications such as SQUID (the open source proxy server) through tools such as the ntlm_auth utility, that does much to create sustainable choice and competition in the FIM market place. Primary domain control, if it is to be scalable to meet the needs of large sites, must therefore be capable of using LDAP. The rapid adoption of OpenLDAP, and Samba configurations that use it, is ample proof that the era of the directory has started. Samba-3 does not demand the use of LDAP, but the demand for a mechanism by which user and group identity information can be distributed makes it an an unavoidable option. At this time, the use of Samba based BDCs, necessitates the use of LDAP. The most commonly used LDAP implementation used by Samba sites is OpenLDAP. It is possible to use any standards compliant LDAP server. Those known to work includes those manufactured by: IBM, CA, Novell (e-Directory), and others. Over the years, public perceptions of what domain control really is has taken on an almost mystical nature. Before we branch into a brief overview of domain control, there are three basic types of domain controllers. The Primary Domain Controller or PDC plays an important role in MS Windows NT4. In Windows 200x domain control architecture, this role is held by domain controllers. Folklore dictates that because of its role in the MS Windows network, the domain controller should be the most powerful and most capable machine in the network. As strange as it may seem to say this here, good overall network performance dictates that the entire infrastructure needs to be balanced. It is advisable to invest more in standalone (domain member) servers than in the domain controllers. In the case of MS Windows NT4-style domains, it is the PDC that initiates a new domain control database. This forms a part of the Windows registry called the Security Account Manager (SAM). It plays a key part in NT4-type domain user authentication and in synchronization of the domain authentication database with BDCs. With MS Windows 200x Server-based Active Directory domains, one domain controller initiates a potential hierarchy of domain controllers, each with its own area of delegated control. The master domain controller has the ability to override any downstream controller, but a downline controller has control only over its downline. With Samba-3, this functionality can be implemented using an LDAP-based user and machine account backend. The Backup Domain Controller or BDC plays a key role in servicing network authentication requests. The BDC is biased to answer logon requests in preference to the PDC. On a network segment that has a BDC and a PDC, the BDC will most likely service network logon requests. The PDC will answer network logon requests when the BDC is too busy (high load). When a user logs onto a Windows domain member client the workstation will query the network to locate the nearest network logon server. Where a WINS server is used, this is done via a query to the WINS server. If a netlogon server can not be found from the WINS query, or in the absence of a WINS server, the workstation will perform a NetBIOS name lookup via a mailslot broadcast over the UDP broadcast protocol. This means that the netlogon server that the windows client will use is influenced by a number of variables, thus there is no simple determinant of whether a PDC or a BDC will serve a particular logon authentication request. A Windows NT4 BDC can be promoted to a PDC. If the PDC is online at the time that a BDC is promoted to PDC, the previous PDC is automatically demoted to a BDC. With Samba-3, this is not an automatic operation; the PDC and BDC must be manually configured, and other appropriate changes also need to be made. Primary Domain Controller the one that seeds the domain SAM. Backup Domain Controller one that obtains a copy of the domain SAM. Domain Member Server one that has no copy of the domain SAM; rather it obtains authentication from a domain controller for all access controls. Standalone Server one that plays no part in SAM synchronization, has its own authentication database, and plays no role in domain security. Algin Technology LLC provide a commercial tool that makes it possible to promote a Windows NT4 standalone server to a PDC or a BDC, and also permits this process to be reversed. Refer to the Algin web site for further information. Samba-3 servers can readily be converted to and from domain controller roles through simple changes to the smb.conf file. Samba-3 is capable of acting fully as a native member of a Windows 200x server Active Directory domain. For the sake of providing a complete picture, MS Windows 2000 domain control configuration is done after the server has been installed. Please refer to Microsoft documentation for the procedures that should be followed to convert a domain member server to or from a domain control, and to install or remove active directory service support. New to Samba-3 is the ability to function fully as an MS Windows NT4-style domain controller, excluding the SAM replication components. However, please be aware that Samba-3 also supports the MS Windows 200x domain control protocols. No synchronously executed Active Directory logon scripts. Can't use Active Directory management tools to manage users and machines. Registry changes tattoo the main registry, while with Active Directory they do not leave permanent changes in effect. Without Active Directory you cannot perform the function of exporting specific applications to specific users or groups. There are two ways that MS Windows machines may interact with each other, with other servers, and with domain controllers: either as standalone systems, more commonly called workgroup members, or as full participants in a security system, more commonly called domain members. It should be noted that workgroup membership involves no special configuration other than the machine being configured so the network configuration has a commonly used name for its workgroup entry. It is not uncommon for the name WORKGROUP to be used for this. With this mode of configuration, there are no Machine Trust Accounts, and any concept of membership as such is limited to the fact that all machines appear in the network neighborhood to be logically grouped together. Again, just to be clear: workgroup mode does not involve security machine accounts. Domain member machines have a machine trust account in the domain accounts database. A special procedure must be followed on each machine to effect domain membership. This procedure, which can be done only by the local machine Administrator account, creates the domain machine account (if it does not exist), and then initializes that account. When the client first logs onto the domain, a machine trust account password change will be automatically triggered. When Samba is configured as a domain controller, secure network operation demands that all MS Windows NT4/200x/XP Professional clients should be configured as domain members. If a machine is not made a member of the domain, then it will operate like a workgroup (standalone) machine. Please refer to Domain Membership, for information regarding domain membership. Configuration of basic TCP/IP and MS Windows networking. Correct designation of the server role (security = user). Consistent configuration of name resolution. Domain logons for Windows NT4/200x/XP Professional clients. Configuration of roaming profiles or explicit configuration to force local profile usage. Adding and managing domain user accounts. Configuring MS Windows NT4/2000 Professional and Windows XP Professional client machines to become domain members. Network logon configuration (since Windows 9x/Me/XP Home are not technically domain members, they do not really participate in the security aspects of Domain logons as such). Configuration of system policy handling. Installation of the network driver “Client for MS Windows Networks” and configuration to log onto the domain. Placing Windows 9x/Me clients in user-level security if it is desired to allow all client-share access to be controlled according to domain user/group identities. Roaming profiles and system/network policies are advanced network administration topics that are covered in Desktop Profile Management and System and Account Policies of this document. However, these are not necessarily specific to a Samba PDC as much as they are related to Windows NT networking concepts. Registers and advertises itself as a domain controller (through NetBIOS broadcasts as well as by way of name registrations either by Mailslot Broadcasts over UDP broadcast, to a WINS server over UDP unicast, or via DNS and Active Directory). Provides a share called NETLOGON. It is rather easy to configure Samba to provide these. Each Samba domain controller must provide the NETLOGON service that Samba calls the domain logons functionality (after the name of the parameter in the smb.conf file). Additionally, one server in a Samba-3 domain must advertise itself as the domain master browser. This causes the PDC to claim a domain-specific NetBIOS name that identifies it as a DMB for its given domain or workgroup. Local master browsers (LMBs) in the same domain or workgroup on broadcast-isolated subnets then ask for a complete copy of the browse list for the whole wide-area network. Browser clients then contact their LMB, and will receive the domain-wide browse list instead of just the list for their broadcast-isolated subnet. The first step in creating a working Samba PDC is to understand the parameters necessary in smb.conf. An example smb.conf for acting as a PDC can be found in the smb.conf file for an example PDC. This contains all the user and group account information. Acceptable values for a PDC are: smbpasswd, tdbsam, and ldapsam. The “guest” entry provides default accounts and is included by default; there is no need to add it explicitly. Where use of BDCs is intended, the only logical choice is to use LDAP so the passdb backend can be distributed. The tdbsam and smbpasswd files cannot effectively be distributed and therefore should not be used. The parameters os level, preferred master, domain master, security, encrypt passwords, and domain logons play a central role in assuring domain control and network logon support. The os level must be set at or above a value of 32. A domain controller must be the DMB, must be set in user mode security, must support Microsoft-compatible encrypted passwords, and must provide the network logon service (domain logons). Encrypted passwords must be enabled. For more details on how to do this, refer to Account Information Databases. The parameters logon path, logon home, logon drive, and logon script are environment support settings that help to facilitate client logon operations and that help to provide automated control facilities to ease network management overheads. Please refer to the man page information for these parameters. The NETLOGON share plays a central role in domain logon and domain membership support. This share is provided on all Microsoft domain controllers. It is used to provide logon scripts, to store group policy files (NTConfig.POL), as well as to locate other common tools that may be needed for logon processing. This is an essential share on a domain controller. This share is used to store user desktop profiles. Each user must have a directory at the root of this share. This directory must be write-enabled for the user and must be globally read-enabled. Samba-3 has a VFS module called “fake_permissions” that may be installed on this share. This will allow a Samba administrator to make the directory read-only to everyone. Of course this is useful only after the profile has been properly created. The additional parameters shown in the longer listing in this section just make for a more complete explanation. Samba-3 is not, and cannot act as, an Active Directory server. It cannot truly function as an Active Directory PDC. The protocols for some of the functionality of Active Directory domain controllers has been partially implemented on an experimental only basis. Please do not expect Samba-3 to support these protocols. Do not depend on any such functionality either now or in the future. The Samba Team may remove these experimental features or may change their behavior. This is mentioned for the benefit of those who have discovered secret capabilities in Samba-3 and who have asked when this functionality will be completed. The answer is maybe someday or maybe never! To be sure, Samba-3 is designed to provide most of the functionality that Microsoft Windows NT4-style domain controllers have. Samba-3 does not have all the capabilities of Windows NT4, but it does have a number of features that Windows NT4 domain controllers do not have. In short, Samba-3 is not NT4 and it is not Windows Server 200x: it is not an Active Directory server. We hope this is plain and simple enough for all to understand. The subject of network or domain logons is discussed here because it forms an integral part of the essential functionality that is provided by a domain controller. All domain controllers must run the netlogon service (domain logons in Samba). One domain controller must be configured with domain master = Yes (the PDC); on all BDCs set the parameter domain master = No. To be completely clear: If you want MS Windows XP Home Edition to integrate with your MS Windows NT4 or Active Directory domain security, understand it cannot be done. The only option is to purchase the upgrade from MS Windows XP Home Edition to MS Windows XP Professional. MS Windows XP Home Edition does not have the ability to join any type of domain security facility. Unlike MS Windows 9x/Me, MS Windows XP Home Edition also completely lacks the ability to log onto a network. Now that this has been said, please do not ask the mailing list or email any of the Samba Team members with your questions asking how to make this work. It can't be done. If it can be done, then to do so would violate your software license agreement with Microsoft, and we recommend that you do not do that. A domain and a workgroup are exactly the same in terms of network browsing. The difference is that a distributable authentication database is associated with a domain, for secure login access to a network. Also, different access rights can be granted to users if they successfully authenticate against a domain logon server. Samba-3 does this now in the same way as MS Windows NT/200x. The SMB client logging on to a domain has an expectation that every other server in the domain should accept the same authentication information. Network browsing functionality of domains and workgroups is identical and is explained in this documentation under the browsing discussions. It should be noted that browsing is totally orthogonal to logon support. Issues related to the single-logon network model are discussed in this section. Samba supports domain logons, network logon scripts, and user profiles for MS Windows for Workgroups and MS Windows 9x/Me clients, which are the focus of this section. When an SMB client in a domain wishes to log on, it broadcasts requests for a logon server. The first one to reply gets the job and validates its password using whatever mechanism the Samba administrator has installed. It is possible (but ill advised) to create a domain where the user database is not shared between servers; that is, they are effectively workgroup servers advertising themselves as participating in a domain. This demonstrates how authentication is quite different from but closely involved with domains. Using these features, you can make your clients verify their logon via the Samba server, make clients run a batch file when they log on to the network and download their preferences, desktop, and start menu. MS Windows XP Home edition is not able to join a domain and does not permit the use of domain logons. The client broadcasts (to the IP broadcast address of the subnet it is in) a NetLogon request. This is sent to the NetBIOS name DOMAIN<1C> at the NetBIOS layer. The client chooses the first response it receives, which contains the NetBIOS name of the logon server to use in the format of \\SERVER. The 1C name is the name type that is registered by domain controllers (SMB/CIFS servers that provide the netlogon service). The client connects to that server, logs on (does an SMBsessetupX) and then connects to the IPC$ share (using an SMBtconX). The client does a NetWkstaUserLogon request, which retrieves the name of the user's logon script. The client then connects to the NetLogon share and searches for said script. If it is found and can be read, it is retrieved and executed by the client. After this, the client disconnects from the NetLogon share. The client sends a NetUserGetInfo request to the server to retrieve the user's home share, which is used to search for profiles. Since the response to the NetUserGetInfo request does not contain much more than	the user's home share, profiles for Windows 9x clients must reside in the user home directory. The client connects to the user's home share and searches for the user's profile. As it turns out, you can specify the user's home share as a share name and path. For example, \\server\fred\.winprofile. If the profiles are found, they are implemented. The client then disconnects from the user's home share and reconnects to the NetLogon share and looks for CONFIG.POL, the policies file. If this is found, it is read and implemented. Password encryption is not required for a Windows 9x/Me logon server. But note that beginning with MS Windows 98 the default setting is that plaintext password support is disabled. It can be re-enabled with the registry changes that are documented in System and Account Policies. Windows 9x/Me clients do not require and do not use Machine Trust Accounts. A Samba PDC will act as a Windows 9x/Me logon server; after all, it does provide the network logon services that MS Windows 9x/Me expect to find. Use of plaintext passwords is strongly discouraged. Where used they are easily detected using a sniffer tool to examine network traffic. There are a few comments to make in order to tie up some loose ends. There has been much debate over the issue of whether it is okay to configure Samba as a domain controller that operates with security mode other than user-mode. The only security mode that will not work due to technical reasons is share-mode security. Domain and server mode security are really just a variation on SMB user-level security. Actually, this issue is also closely tied to the debate on whether Samba must be the DMB for its workgroup when operating as a domain controller. In a pure Microsoft Windows NT domain, the PDC wins the election to be the DMB, and then registers the DOMAIN<1B> NetBIOS name. This is not the name used by Windows clients to locate the domain controller, all domain controllers register the DOMAIN<1C> name and Windows clients locate a network logon server by seraching for the DOMAIN<1C> name. A DMB is a Domain Master Browser see The Network Browsing Chapter, Configuring WORKGROUP Browsing; Microsoft PDCs expect to win the election to become the DMB, if it loses that election it will report a continuous and rapid sequence of warning messages to its Windows event logger complaining that it has lost the election to become a DMB. For this reason, in networks where a Samba server is the PDC it is wise to configure the Samba domain controller as the DMB. SMB/CIFS servers that register the DOMAIN<1C> name do so because they provide the network logon service. Server that register the DOMAIN<1B> name are DMBs meaning that they are responsible for browse list synchronization across all machines that have registered the DOMAIN<1D> name. The later are LMBs that have the responsibility to listen to all NetBIOS name registrations that occur locally to their own network segment. The network logon service (NETLOGON) is germane to domain control and has nothing to do with network browsing and browse list management. The 1C and 1B/1D name services are orthogonal to each other. Now back to the issue of configuring a Samba domain controller to use a mode other than security = user. If a Samba host is configured to use another SMB server or domain controller in order to validate user connection requests, it is a fact that some other machine on the network (the password server) knows more about the user than the Samba host. About 99 percent of the time, this other host is a domain controller. Now to operate in domain mode security, the workgroup parameter must be set to the name of the Windows NT domain (which already has a domain controller). If the domain does not already have a domain controller, you do not yet have a domain. Configuring a Samba box as a domain controller for a domain that already by definition has a PDC is asking for trouble. Therefore, you should always configure the Samba domain controller to be the DMB for its domain and set security = user. This is the only officially supported mode of operation. A machine account, typically stored in /etc/passwd, takes the form of the machine name with a “$” appended. Some BSD systems will not create a user with a “$” in the name. Recent versions of FreeBSD have removed this limitation, but older releases are still in common use. The problem is only in the program used to make the entry. Once made, it works perfectly. Create a user without the “$”. Then use vipw to edit the entry, adding the “$”. Or create the whole entry with vipw if you like; make sure you use a unique user login ID. The machine account must have the exact name that the workstation has. The UNIX tool vipw is a common tool for directly editing the /etc/passwd file. The use of vipw will ensure that shadow files (where used) will remain current with the passwd file. This is important for security reasons. This will break all network connections. Further, if the machine is already a “member of a workgroup” that is the same name as the domain you are joining (bad idea), you will get this message. Change the workgroup name to something else it does not matter what reboot, and try again. This occurs when the domain SID stored in the secrets.tdb database is changed. The most common cause of a change in domain SID is when the domain name and/or the server name (NetBIOS name) is changed. The only way to correct the problem is to restore the original domain SID or remove the domain client from the domain and rejoin. The domain SID may be reset using either the net or rpcclient utilities. Workstation Machine Trust Accounts work only with the domain (or network) SID. If this SID changes, domain members (workstations) will not be able to log onto the domain. The original domain SID can be recovered from the secrets.tdb file. The alternative is to visit each workstation to rejoin it to the domain. This problem is caused by the PDC not having a suitable Machine Trust Account. If you are using the add machine script method to create accounts, then this would indicate that it has not worked. Ensure the domain admin user system is working. Alternately, if you are creating account entries manually, then they have not been created correctly. Make sure that you have the entry correct for the Machine Trust Account in smbpasswd file on the Samba PDC. If you added the account using an editor rather than using the smbpasswd utility, make sure that the account name is the machine NetBIOS name with a “$” appended to it (i.e., computer_name$). There must be an entry in both the POSIX UNIX system account backend as well as in the SambaSAMAccount backend. The default backend for Samba-3 (i.e., the parameter passdb backend is not specified in the smb.conf file, or if specified is set to smbpasswd, are respectively the /etc/passwd and /etc/samba/smbpasswd (or /usr/local/samba/lib/private/smbpasswd if compiled using Samba Team default settings). The use of the /etc/passwd can be overridden by alternative settings in the NSS /etc/nsswitch.conf file. Some people have also reported that inconsistent subnet masks between the Samba server and the NT client can cause this problem. Make sure that these are consistent for both client and server. Enable the user accounts with smbpasswd -e username . This is normally done as an account is created. A domain controller has to announce its role on the network. This usually takes a while. Be patient for up to 15 minutes, then try again. testparm -v | grep channel and looking for the value of these parameters. It is important that these be set consistently with the Samba-3 server settings. See also Account Information Databases. See Network Browsing, and Integrating MS Windows Networks with Samba.